CLIMATE CHANGE: "A clearly frustrated President Barack Obama displayed impatience Friday with world leaders' failure to reach agreement on a new climate pact, saying America is setting an example of bold action and other nations must follow or see the world suffer catastrophic effects," the Associated Press' Jennifer Loven reports. "Acknowledging that some nations feel the United States is not doing enough, Obama said it's better to embrace an imperfect accord than to reach an impasse. 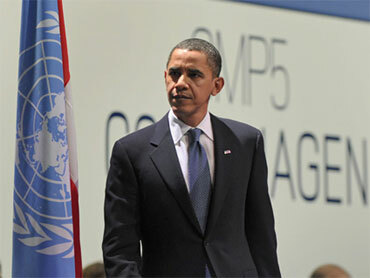 'No country will get everything that it wants,' Obama said in a brief address to the 193 nations gathered here to cap a climate summit stalemated after two weeks of talks. "Without mentioning China specifically, he addressed Beijing's resistance to making its emissions-reduction pledges subject to international review. "'I don't know how you have an international agreement where we all are not sharing information and making sure we are meeting our commitments,' Obama said. 'That doesn't make sense. It would be a hollow victory.'" "Emerging from a multinational meeting boycotted by Chinese Premier Wen Jiabao, Obama warned delegates that U.S. offers of funding for poor nations would remain on the table 'if and only if' developing nations, including China, agreed to international monitoring of their greenhouse gas emissions," adds Politico's Glenn Thrush. "'I have to be honest, as the world watches us... I think our ability to take collective action is doubt and it hangs in the balance,' Obama told the CO-15 plenary session as hope for anything more than a vague political in agreement faded. Washington Post's David A. Fahrenthold and Juliet Eilperin, "Five questions about the Copenhagen climate talks"
HEALTH CARE: "Nebraska Senator Ben Nelson threw a Christmas deadline for passage of health-care legislation into further doubt, rejecting a compromise on abortion and saying he doesn't see how fellow Democrats can resolve all his objections," report Bloomberg News' Laura Litvan and Kristin Jensen. "'I can't tell you that they couldn't come up with something that would be satisfactory on abortion between now and then and solve all the other issues that I've raised to them, but I don't see how,' Nelson said in an interview with KLIN radio in Lincoln, Nebraska. "Nelson, who says the bill doesn't do enough to prevent U.S. subsidies from being used to fund abortions, yesterday rebuffed new language offered by Democrats. Nelson told reporters he's also worried about proposed cuts to the Medicare program for the elderly and the cost burden for his home state. "President Barack Obama and Senate Majority Leader Harry Reid need Nelson's support for the measure because they have no Republican backing. Unless more revisions are made, Nelson said he would join with Republicans to block action." "Nelson, an antiabortion Nebraskan who is the last Democrat withholding support for the legislation, rejected an overture by party leaders to address his concerns about the bill's handling of abortion. Among other things, Democratic leaders proposed to create a new tax credit that would promote adoptions," add the Wall Street Journal's Greg Hitt and Janet Adamy. "Senate Democratic Leader Harry Reid of Nevada continued to work to get 60 votes, the number needed to ensure passage of the legislation, said Reid spokesman Jim Manley. With Mr. Nelson's vote in doubt, President Barack Obama met with Maine Sen. Olympia Snowe, the lone Republican to show interest in supporting the package, to see if she would back the bill. Sen. Snowe is an abortion-rights supporter. "'He'd prefer to get this moving,' Sen. Snowe said. She added that she urged the president to postpone action and use 'part of January' to deal with her concerns, which include a proposal to establish a new long-term care program. 'The time frame is totally unrealistic,' she said of the push for a vote by Christmas." Meantime, "With the clock ticking down on health care reform, Senate Majority Leader Harry Reid (D-Nev.) has until Saturday to strike a 60-vote compromise if Democrats hope to meet a Christmas Eve deadline - but the obstacles kept piling up Thursday," reports Politico's Carrie Budoff Brown. "Reid still had no legislative text and no cost analysis to release. 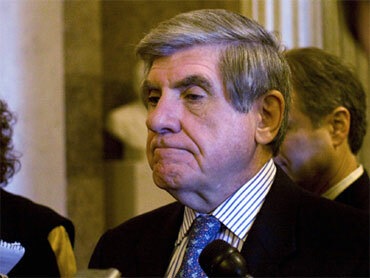 One of the final moderate holdouts, Sen. Ben Nelson (D-Neb. ), rejected compromise language on abortion funding and said he's doubtful a bill can pass by Christmas. Two powerful unions blasted the bill. House Democrats threatened to undo the Senate bill during a conference committee. And a Democratic war over the bill raged on the Internet and cable news. "The White House sunk deeper into the fight within its own party, working throughout the day to discredit the claims of former Democratic National Committee Chairman Howard Dean that the Senate bill is so weak it should be scrapped. "The net effect was the loss of any sense of inevitability surrounding the passage of health care legislation by the end of the year as Reid struggled to keep it on track." CBS News' Nancy Cordes, "Tensions Grow Among Liberals"
Wall Street Journal's Naftali Bendavid and Peter Wallsten, "Angry Liberals Edge Toward a Mutiny"
NY Times' Sheryl Gay Stolberg, "Liberal Revolt on Health Care Stings White House"
LA Times' Noam N. Levey, "Senate healthcare bill now relies on regulation"
Washington Post's Philip Rucker, "Democratic congressman from North Carolina angers supporters by voting against health-care bill"
5971654CONGRESS: Politico's David Rogers, "War bill survives poisonous 1 a.m. vote": "A $626 billion Pentagon budget narrowly advanced in the Senate Friday morning but not before Washington's political battles seemed to eclipse the real wars of Iraq and Afghanistan overseas. "The whole Senate scene, played out in a post midnight session on a freezing night, dramatized how poisonous the atmosphere has become in the health care fight. "Defense Secretary Robert Gates had to weigh in for fear the military would be left with only stop-gap funding while fighting two wars overseas. And the ailing 92-year-old Sen. Robert Byrd (D-W.V.) was wheeled in for the 1 a.m. vote while his old friend, Sen. Thad Cochran (R-Miss.) deserted the bill under pressure from his own leadership to slow action. "Senate Minority Leader Mitch McConnell (R-Ky.) made no secret of the fact that he was looking for leverage over Majority Leader Harry Reid (D-Nev.) to delay action on health care reform until after Christmas. The pressure on rank-and-file members was severe, and it was only after Democrats had secured the needed 60 votes that three Republicans broke ranks in support of cutting off debate. 5869074AFGHANISTAN: "U.S. Ambassador to Afghanistan Karl Eikenberry Thursday further signaled that a strong American military presence will remain in Afghanistan long after July 2011, when President Obama plans to end his troop surge," reports McClatchy Newspapers' Thomas L. Day. "Speaking at the Afghan Ministry of Foreign Relations before a group of diplomats, non-governmental organizations and Afghan citizens, Eikenberry drove home the Obama administration's sometimes contradictory message. To the Afghan government: act with urgency. To the Afghan people: We will not abandon you. "Eikenberry suggested that the July 2011 date for beginning a U.S. troop drawdown is flexible. 'This is not a deadline despite what some people in the United States and Afghanistan have said,' Eikenberry said. He added that American withdraw in 18 months is 'entirely based on the conditions that exist at that time.'" Washington Post's Walter Pincus, "McCaskill calls for increased oversight of contract work in Afghanistan"
Wall Street Journal's Sudeep Reddy, "Banking Panel Backs Bernanke for New Term"
NY Times' Rachel L. Swarns, "At White House, Holidays Are Both Treat and Test"
Associated Press, "Obama: Santa to use Yellow Room chimney"
Politics Daily's Lynn Sweet, "How Michelle Obama Turned Around Her Image"
Politico's Mike Allen, "Sarah Palin cuts vacation short"